Kiliaen van Rensselaer was a Dutch minister affiliated with the Dutch West Indies Company who lived at Fort Orange (above) in 1642 with his wife and children in what is today Albany, New York. Today, the fort is under an expressway. He worked with the Mohawk Indians, recording his experiences in a series of letters which were eventually published as a book. The Van Rensselaer Bowier Manuscripts: Being the Letters of Kiliaen van Rensselaer, is available free at this link. You can read an article about his findings relative to living among the Mohawks in 1644 at this link. 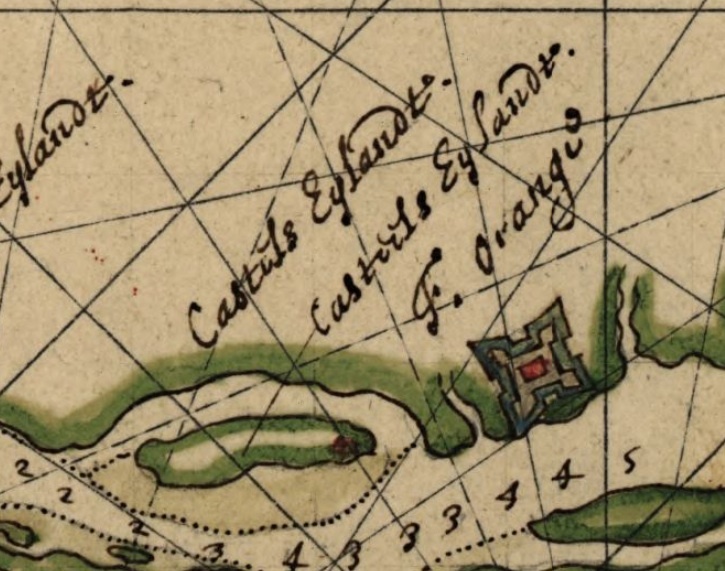 This map is a map of the river area and Fort Orange on the left between the letters I and S.
A map of the Native tribes of the area can be found at this link. This entry was posted in Mohawk, New York. Bookmark the permalink.